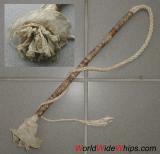 This little bark whip is made from a single branch of the lacebark tree (Lagetta lagetto), using its cloth-like bark for the twisted thong and a rose-shaped handle decoration. A long stick was used, with the outer bark and the wood removed (except for the rigid handle). The remaining inner bark was then beaten soft and twisted like a rope to form the thong. The ´rose´ was shaped just by dividing and stretching the several layers of the bark. Total length: about 5ft over all, thong 3ft.